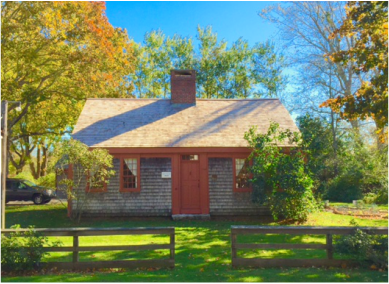 The Dottridge Homestead reflects life in coastal Cotuit during the early 19th century. The furniture and collections chosen for the Dottridge Homestead are appropriate to the early years of the home (1808 – 1840). Samuel Dottridge and his wife Abigail raised seven children in this wood framed Cape Cod style house. The Museum Building, located directly behind the Homestead, offers regional items from the permanent collection and features ship models, Cotuit souvenir China, photographs, quilts, advertising signs, whaling artifacts, tools, fans, and a replica of the office of Dr. Donald Higgins, a longtime Cotuit physician. ​Located on the south side of the property next to the Homestead is an authentic 19th Century garden, one which would have been tended by Mrs. Dottridge. The Kitchen Garden has heirloom plants grown in New England prior to 1850. The Cotuit Bird and Garden Club maintains the garden.